Dramas for the winter are approaching fast. Daily dramas broadcast in the evenings will commence on the 28th and they aim for housewives with female characters with stories to tell. 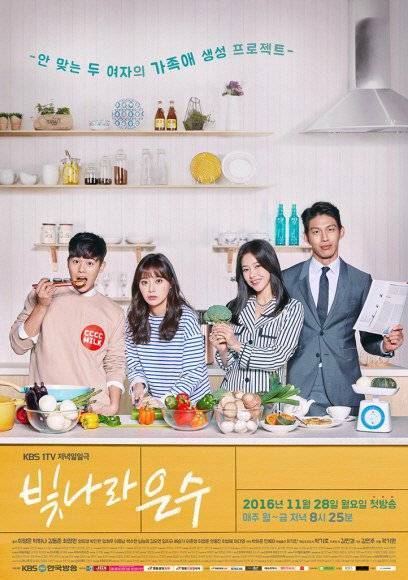 - KBS 1TV "Shine Eun-soo"
"Shine Eun-soo" is the story of a student and a teacher who hate each other, reuniting 7 years later, married to brothers. Then they become step sisters because of their parents' remarriage. The key point here is the two women. Lee Yeong-eun takes on the role of Oh Eun-soo, a contract worker at Yoonga Foods and former teacher. Eun-soo became enemies with her student Bit-na not long after she became a teacher. Lee Yeong-eun appeared as Kim Rae-won's goody-two-shoes sister in the SBS drama "Punch" but this time, she's a fussy character with some trickiness up her sleeves. Park Ha-na takes on the role of Kim Bit-na, the only child of a wealthy family who was raised with everything she ever wanted. ZEA member Kim Dong-joon takes on the role of Yoon Soo-ho, an employee of Yoonga foods and youngest son. - KBS 2TV "First Love Again"
"First Love Again" is the story based on a man and a woman who reunited 8 years later. Ha-jin (Myung Se-bin) puts the past behind her and lives a new life while Do-yoon (Kim Seung-soo) lives in anger after being betrayed by his first love. Park Jung-chul and Wang Bit-na are their lovers and they get involved in a complicated relationship. "Love Bubbles" is about cellular memory which is about a phenomenon in which the receivers of an organ also receive the personality and habits of the donor. Eun Bang-wool (Wang Ji-hye) meets Park Woo-hyeok (Kang Eun-tak) who receives her husband Yoon Dong-joon's (Kang Dong-ho) heart. Eun Bang-wool has a knack for vegetables and fish as she was born in a seaside village. She's known as Eun Jang-geum at the fish market and she's tomboyish but she's a great cook. Park Woo-hyeok is a cold hearted person until he meets Eun Bang-wool. Other casts are Gong Hyeon-joo, Kim Min-soo and Lee Jong-soo. Meanwhile, MBC daily drama "Golden Pocket" is currently airing and is about a genius doctor turning into a master of dumplings.